Urealdene Henderson, Mr. and Mrs. Cruz Valdez, and Kyley Givens, proudly holding titles to their homes which they obtained after waging struggles against unjust tax foreclosures of their homes. A great week for Detroit Eviction Defense! At our regular meeting at the Metro AFL-CIO, we celebrated the success of three homeowners who defended their homes against foreclosure and eviction. The following day, a fourth homeowner won back her home after a long campaign of legal and direct action. Three of the homeowners– Urealdene Henderson, Mr. and Mrs. Cruz Valdez, and Kyley Givens– were resisting eviction by investors who bought the homes out from under them at tax foreclosure. 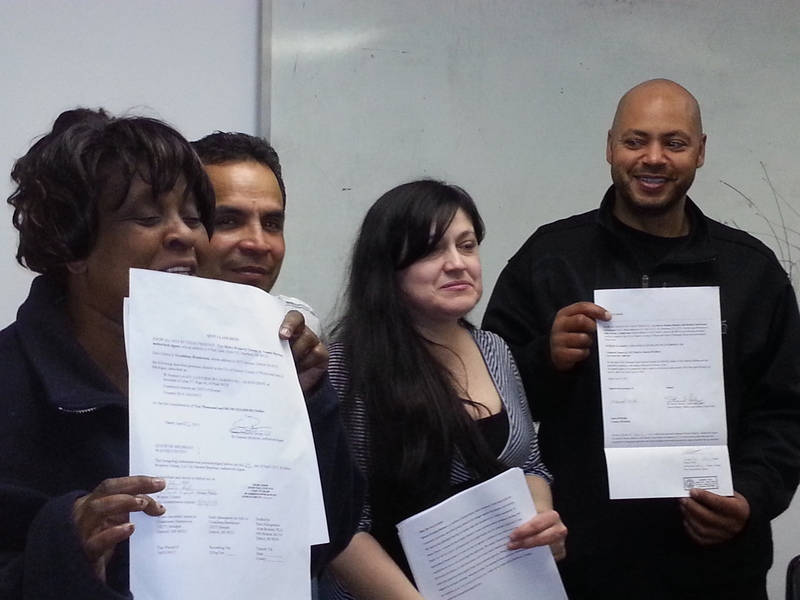 The photo by Terry Hall (link below) shows the happy homeowners at our Thursday meeting with the deeds to their homes. On Friday, the Freddie Mac trust that owned Alma Counts’ mortgage agreed to sell her back her home for market value. These happy outcomes were the result of collective action by homeowners, neighbors and activists. Sometimes we picketed the bank or the realty company, sometimes we rallied at the home and canvassed the neighborhood, sometimes we packed the courtroom at eviction hearings, sometimes we raised money at neighborhood fundraisers. We pressured investors and Freddie Mac to sell back these homes at something close to cost or market value, and then United Community Housing Coalition helped close the deal in several cases by providing no-interest micro loans. Hats off also to attorneys Vanessa Fluker and Bob Day. We can win these skirmishes, but we have to confront the larger arena in which Fannie Mae and Freddie Mac continue to foreclose on thousands of hard-pressed homeowners, refusing to reduce mortgage principal on underwater loans to keep people in their homes. We can start to address these issues at the Peoples’ Hearing on May 20 (flyer attached).